Tailor' has a pattern of an enlarged twill or herringbone weave. The colours are black-grey with some beige tones and a touch of dark blue and dark green. It has a strong yet elegant apperance, almost like a nice fabric for a suit. We have been working with toning the colours across the long sections and we are pleased to see the old and felted, sometimes moth-eaten wollen sweaters transformed into an exclusive rug. The material is donated by Myrorna (The Salvation Army). 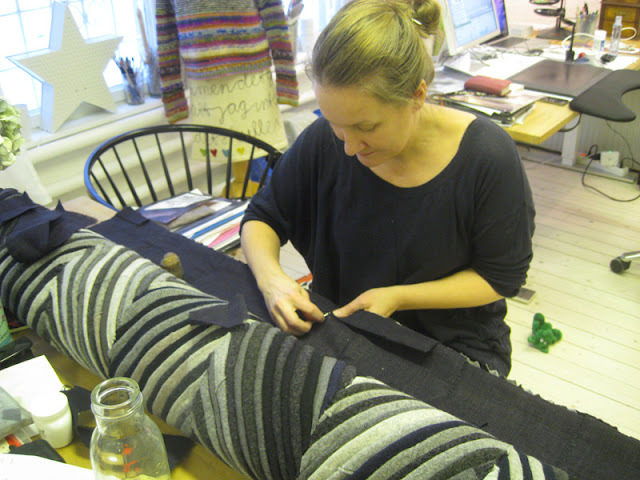 The rug is made in long sections of mirror faced diagonal stripes, folded and stitched onto a base fabric. The pieces could be made per meter, in different colors and combined into variations and designs of twill weaves. The rug was created to be part of the exhibition Business Boudoir at the Trash Hotel at the furniture fair Habitare in Helsinki 2012.